According to Amnesty International, Israel severely limits access to water in the Palestinian territories and imposes highly discriminatory water policies. "Israel only allows Palestinians access to a fraction of the water resources that are located mainly in the occupied territories of the West Bank. In the meantime, illegal Israeli settlements receive virtually limitless supplies of water" writes Amnesty. Its report states that the average Israeli consumes 4 times as much water as a Palestinian. This inequality is even more extreme in some regions of the West Bank where Israeli occupiers use 20 times more water per resident than their local Palestinian neighbors, who survive on just 20 liters a day. "Swimming pools, well-watered lawns and vast irrigated fields of agricultural production in the Israeli settlements pose a stark contrast to Palestinian villages where the residents have to fight to satisfy their basic need for water" continues the report. Israel prevents Palestinians from digging new wells. Palestinians cannot even restore old wells without a designated permit. To make matters worse, many roads in the West Bank are closed by Israel or allowed only limited use. This impedes tanker trucks from replenishing the water supplies of villages that are cut off from the water distribution network. Last winter, in the Gaza Strip, the Israeli offensive severely damaged water reservoirs, wells, drains and pumping stations. The damage created by these attacks has further increased the water shortages caused by Israel and Egypt’s ongoing blockade of Gaza. 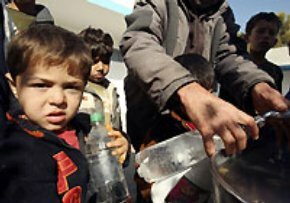 Amnesty estimates that there are between 180,000 and 200,000 Palestinians in the West Bank without access to running water.